Please post your thoughts here - improvement, potential changes or the negative sides of it. Try it out a bit before posting! Change seems good, people aren't running in circles, I'm getting inf fights and rangers seem to be able to do stuff better. Cav is a bit harder but that's to be expected as they had it easy before. If the flag is spawning instantly some of the flag spawns need to be moved for public play, ravens nest is extremely hard to get to on one side and the central flag spawn is also favourable to the same side. Verloren might need the attackers spawn flag shifting somewhere, not sure how long the defending team has to get there. Basically any flag which takes a difference of roughly 40 seconds for each team to arrive on probably needs moving. Generally though I like it, feels much better. Suggestions would be nice. I can update the maps some, but I don't want to change the server too much from how competitive looks. For an example, Verloren's flag will probably stay as it's like that in competitive, which helps. I agree that it's a problem, but it's kinda silly (somewhat) to change just because. If a flag becomes too much off and issue though, I agree. I like it a lot, different scenarios are constantly being thrown at the player. You might consider increasing the class limit on rangers (as in, making sure there are less archers) as the more static fights make lots of archers pretty OP, but perhaps the other classes just need more time to adapt so we'll see. Currently, 40% archers means roughly 10 archers / team, or in a normal match scenario - it'd look like roughly 3.2 archers / team. A more realistic amount would be roughly 2.5 (as some teams run 3, some run 2 - though 2 is standard), so ~31% would be 'realistic' (even on open maps). 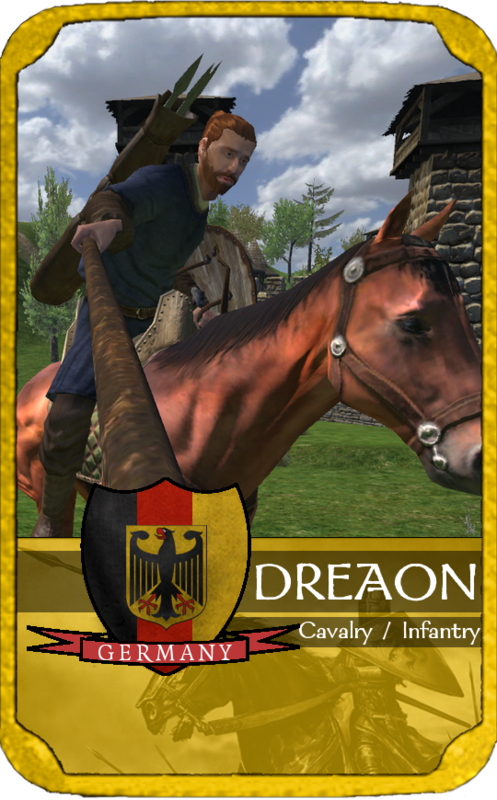 For cavalry, 4 or 5 in an 8-set team would look like roughly 50%, a bit above - which would be too much on some maps, right? So 50% is fine. To set all class limits to be 'more or less' realistic. A LOT of archers would complain though, as well as some infantries - is it worth this change, to sacrifice that amount of players wanting to play their own class? I wouldn't worry about it being the same as competitive, it's already not, you're playing public. Just make the maps suit the public game mode correctly. People don't practice strategy and tactics on IG, they want to be able to play the game in a fair to decent way that is useful for practice. Changing to instant flag spawning has fixed a lot of the problems, players now have an objective to play around and people are playing much more intelligently. It's a lot better. The only real problem now is that some of the flag spawns are horrifically one sided. I would recommend spending some time and doing infantry time trials to see what the difference in arrival time is on flags. If it's too much, move the flag, no one is going to mind if the flags aren't in the same spots. Mostly, but removing the resemblance is equally stupid to do 'just because'. The positions are way for people to know where to go, where to contest and how. Regardless of how much public the server is, people do take the positions they know is the best from matches more often than not. Having to play in weird, new positions might have some good to it - like, Raven's Nest is not a competitive map, so we can do a bit of 'whatever' on it - right? But on Verloren it's different. I'll see how I can balance it, and how much the issues become in the next few days. For some maps, it could be an option to move the spawn. Like that, people could fight under the same flags as the competitive maps, but have more equal starting positions fitting for public play. It always depends on the map though. I have a purpose playing inf now instead of sticking near Leroux or Rayden. So thumbs up for this change. Is it possible to add more then 3 flag spawns? If so, keep the current ones and add another 5+ per map. It might be possible, but that's too much. 3 is complicated enough, let's keep it to balancing these 3 instead of balancing 5. I've made an attempt to fix the Raven's Nest flags - moved one to the middle of the top instead of the spawn, and moved the one at the bottom of the balcony spawn more towards the middle area, so there's no way for one team to camp the only way to the flag. Removed Port Assault, added FbtR - hopefully it will be fine, but I'm up for removing it if it becomes an "issue". Cool! One more permanent solution without having to tinker with every unbalanced spawn is to raise the amount of time it takes to raise the flag - just by 20-30secs or so. Enough so that flag-raising can't be ignored but not enough that when a team spawns right next to a flag the attacker has zero chance if there's anything delaying him whatsover (example Hives throwing javs at you). I think atm, since I've moved the flags that spawn inside the spawns, it should be solved. We'll see later on! Flags are still iffy on Raven's Nest, not sure if your update is on? I do think a more general change to the flags would be easier than updating every slightly problematic flag however. Less work for you/mappers.